Performs very well, easy to use, stands out, unique design. Don't block the vents - asides from that it works really well. The Spoutnik range is available in 3 different colours - the Blue Fagor Spoutnik, Green Fagor Spoutnik and the Purple Fagor Spoutnik - all of which feature the same translucent domed lid. This transparency makes it easy to check on your food, enabling you to see it from all angles, which helps eliminate overcooking. The Fagor SPOUT7UV doesn't feature a grill or convection oven - however it does include four different power settings, from high to defrost, all of which cooked (or heated) the food evenly without any noticeable cold spots. The design of this purple microwave is the main selling point - you'll either love or hate it. The rounded shape means it takes up a lot less room than the average microwave, so if you're kitchen is a bit on the small size, then one of these microwaves will be ideal. Despite this small size it still features a substantial 28cm glass turntable. The controls are very easy to use, and the backlit digital display can be read in the dark as well as in brightly lit kitchens. Overall we really liked this microwave range - it works well, and looks great, as well as being easy to clean and maintain. 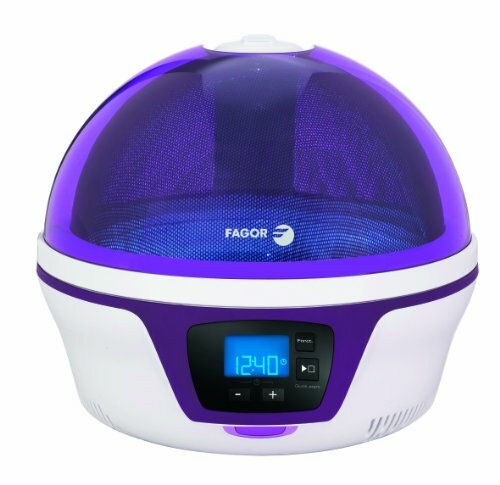 Overall a good performer - the SPOUT7UV purple dome microwave from Fagor works well, and also stands out from the crowd - it's well worth considering if you're after a new microwave.